This ridiculously intricate map charts out the hidden geography and scope of the internet, ranging from assigning proportional landmass to the world's most popular websites, to drawing out the large swaths of free-flowing spam, to creating a color-coded look at the strength of internet surveillance. 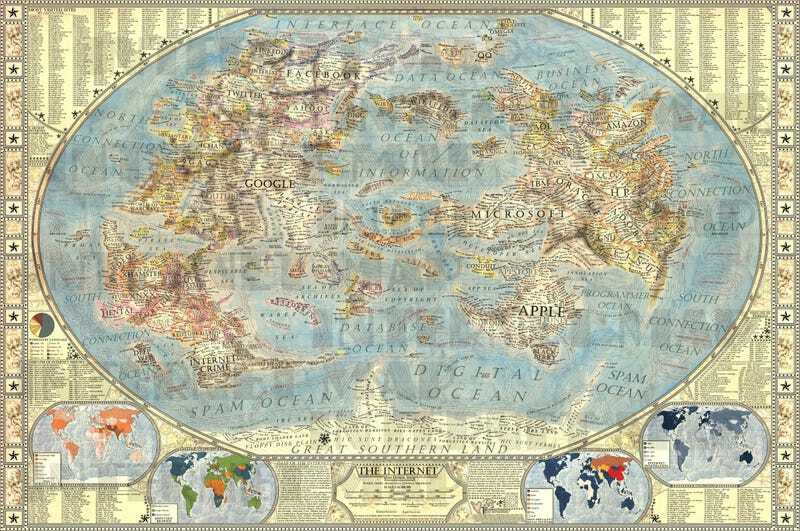 The map is the work of Martin Vargic, an amateur cartographer and graphic design student in Slovakia, who based the design of old National Geographic maps, along with a map of the internet put out by xkcd in the fall. He calls it Map of the Internet 1.0, noting that "this is definitely not the final version, [an] incredible amount of websites and software companies are not on the map and will be incorporated in later updates." We're excited to check out the final copy, but the 1.0 is already looking pretty terrific.